Gates with drawbridges were provided in the town wall at various points on main roadways. These were often the last part of the wall to be removed or demolished. Old Town or North Gate: the first gate here was destroyed by the French (Bretons) in 1379. The last one was built in 1759 and removed circa 1809. The area outside the Gate, upon which Cobourg Place, Pound Street, the Plymouth Public Free Schools and New Town were subsequently built was known as "Old Town Without". "Old Town" or "Northern Gate"
which was first erected about 1378.
and finally removed about 1809.
until during the post-war reconstruction it was re-sited close to Timothy Whites and Taylors. just to the north of the entrances in Cornwall Street. A replica of the Old Town Gate erected for the visit of the Royal Agricultural Show in 1890. Martyn's Gate was part of the original Town Wall around Plymouth. Briton Side or Breton Side, was outside this Gate and people who loved beyond it were known as Breton Boys. That area was destroyed by the French, who were prevented from taking the Gate and thereby gaining access to the Town. When the Wall was extended to protect that area, Coxside Gate, or New Gate, was erected. Martyn's Gate survived until 1789 when it was demolished at following an accident to one of the servants of the royal princes was injured while passing through it in a carriage. The cost of its removal was raised by public subscription. Coxside or East or New Gate was erected when the Town Wall was extended to include Breton Side. It was removed shortly after 1809. Jory's Almshouses stood nearby. 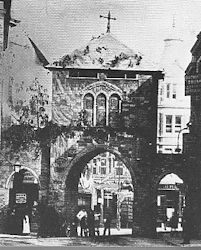 Barbican or South Gate: removed in 1831. 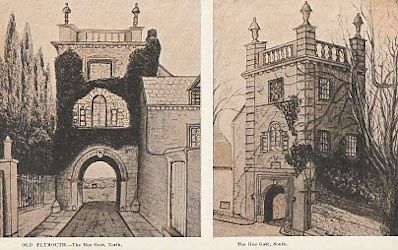 Hoe Gate: the last to be removed, in 1863. Strenuous efforts were made to preserve Hoe Gate, which had become the property of a Mr T W Fox. However, he could not be persuaded and sold the materials for £44. Under the Authority of the CHARTER of HENRY the VI. It was only after these Gates had been removed that Plymouth started to grow to the north and east.